In my last article, Grouping by Unique Subsequences in Oracle, I compared three solutions to a querying problem in Oracle. I found that a solution using a pipelined function was fastest across a range of test data sets, while another using Oracle’s Model clause turned out to be extremely inefficient, and very unscaleable owing to quadratic variation in execution times. I mentioned in the article the issue of possible poor cardinality estimates by Oracle’s Cost-Based Optimiser (CBO) for pipelined functions, referencing an article by Adrian Billington, setting cardinality for pipelined and table functions, that considers four techniques for improving these estimates. In this article, I want to use another, very common, querying problem, to see in more detail how one of these techniques works, namely the dynamic sampling hint, and to compare the performance again of pipelined functions against the Model clause on a second example amenable to both methods. In previous articles I have generally focussed on elapsed and CPU times to measure performance, but Oracle provides a range of metrics in instrumenting query execution. My benchmarking framework captures many of these, and we’ll use them to try to understand the performance variation, again using a 2-dimensional domain of test data. We also capture the execution plans used across the domain and display visually the changes across the domain. The problem is that of list aggregation, and various solution methods are available depending on one’s Oracle version. In Oracle v11.2 a specific built-in function has been provided, Listagg, and Adrian Billington has compared it with earlier SQL techniques (listagg function in 11g release 2), including a Model solution. He looks only at pure SQL solutions, but we will take both the Model and Listagg solutions, and add in a pipelined function solution. We’ll take a simple test problem using Oracle’s demo HR schema, which will be: Return, for each department, its id, manager name, and a comma-separated, ordered list of its employee names. The HR tables employees and departments were copied structurally to test versions with _t suffixes and records were inserted programmatically by the performance testing packages. The first solution for this problem uses the aggregation function ListAgg, which is new in Oracle v11.2. The query groups employees by department, joins departments to get the name, and employees again to get the manager’s name. This approach is based on pipelined database functions, which are specified to return array types. Pipelining means that Oracle transparently returns the records in batches while processing continues, thus avoiding memory problems, and returning initial rows more quickly. 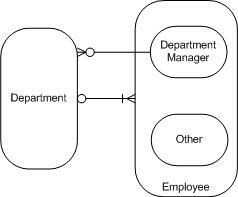 Within the function there is a simple cursor loop over the employees, joining departments to get the manager id. 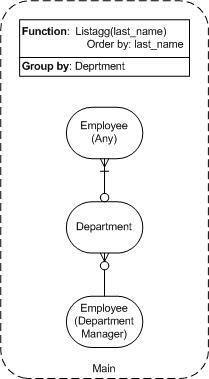 A string variable accumulates the list of employees, until the department changes, when the record is piped out, and the string reset to the new employee. The last record has to be piped after exiting the loop. 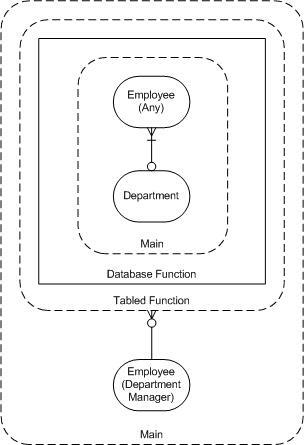 Two database types are specified, the first being an object with fields for the department and manager ids and the employee name list; the second is an array of the nested table form with elements of the first type. Just select the fields named in the record from the function wrapped in the TABLE keyword, and join employees to get the manager name. As in the previous article, I have benchmarked across a 2-dimensional domain, in this case width being the number of employees per department, and depth the number of departments. For simplicity, a single department, ‘Accounting’, and employee, ‘John Chen’, were used as templates and inserted repeatedly with suffixes on names and new ids. The three queries above were run on all data points, and in addition the function query was run with a hint: DYNAMIC_SAMPLING (d 5). Model was always the slowest query, generally by a factor of about 8 over the fastest in terms of CPU time, but very much worse in elapsed time for problems above a certain size, and we’ll look at this in more detail next. In Adrian Billington’s article mentioned above (listagg function in 11g release 2), he took a single large-ish data point for his problem and found that his Model query took 308 seconds compared with 6 seconds for Listagg. He puts the Model performance down to ‘an enormous number of direct path reads/writes to/from the temporary tablespace‘. In my last article, I also quoted the anonymous author of MODEL Performance Tuning: ‘In some cases MODEL query performance can even be so poor that it renders the query unusable. One of the keys to writing efficient and scalable MODEL queries seems to be keeping session memory use to a minimum’. My benchmarking framework records the metrics from the view v$sql_plan_stats_all, which is used by DBMS_XPlan.Display_Cursor to write the execution plan, and prints to a CSV file aggregates over the plan of several of them, for example: Max (last_disk_reads). These are are shown for the Model solution in the tab displayed below of the embedded Excel file (the next tab has 3-d graphs but they may not display in a browser). The tables show that memory increases with the problem size in each direction up to a maximum, at which points the number of disk reads jumps from a very low level and then rises with problem size. The maximum memory points have red font. These transitions represent discontinuities where there is a jump in the elapsed times, although CPU times continue to rise smoothly. So while Model is always slower than the other solutions, its much greater use of memory causes the discrepancy to increase dramatically when the processing spills to disk, which is consistent with, and extends, the observations of the authors mentioned. Notice that the cardinality estimates are accurate apart from at line 1 for the Sort Group By, where a similar error has been made in not allowing for the reduction in rows caused by the grouping. Again it doesn’t seem to have affected the plan adversely. Notice that in the plan without dynamic sampling the cardinality estimate for the row set returned from the function is 8168, nearly 8 times the actual rows. When dynamic sampling is added the cardinality estimate is exactly right. Also the times reported in the plan are similar but show dynamic sampling to be faster. How can that be, when the table of results earlier showed the query with dynamic sampling taking nearly twice as long? If one looks at the colour-coded table of elapsed times above, it can be seen that dynamic sampling causes a single plan to be chosen for all data points with depth below 1024, while without the hint two plans are chosen that with dynamic sampling are chosen only at depth 1024. It can also be seen that the dynamic sampling version is faster overall in most cases, but at the highest depth is slower because the non-hinted plan is the same. The default cardinality estimate (8168) was too high until that point. This entry was posted in Data model, ERD, Model, Oracle, Performance, Pipelined, SQL and tagged benchmarking, cpu, ERD, Oracle, performance, QSD, SQL by BrendanP. Bookmark the permalink.